Scientists from the Marine Biological Association of the UK (MBA) and the University of Plymouth studied kelp forests off the south west of the United Kingdom. Here, the warm water kelp species Laminaria ochroleuca has increased in abundance in recent years, probably at the expense of a cold-water species less tolerant to warming seas. Writing in the Journal of Ecology, the researchers say this is a direct result of climate change and has the potential to alter how species that depend on kelp forests need to function in the future. However, the study says the situation is not all bad news with some of the functions examined, such as carbon absorption or food provisioning, being maintained or even enhanced. Moreover, this important habitat will likely survive in the future, in contrast to several other areas of the world – including Japan, Canada and Australia – where kelp forests are disappearing completely. Kelp forests are to coastal seas what the great woodlands are to life on land. For marine organisms they provide places to live, food and shelter from predators, while for us they fix a large amount of carbon dioxide, and reduce storm and wave energy hitting the coastline. They also provide us with food and materials like gelling agents, and are at the base of food chains that ultimately generate economically important fish and shellfish stocks. Most studies so far have looked at how non-native invasive species introduced by humans alter ecosystems, with far less attention being paid to the impacts on ecosystem functioning of species expanding into new habitats as a result of climate change. 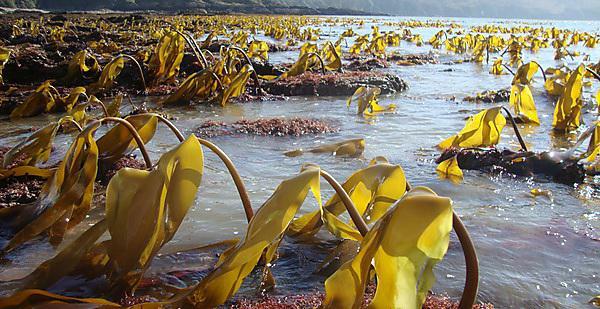 However, this research found the warm-water kelps essentially acted as a conveyor belt of food production, growing and shedding its leaf-like lamina throughout the year, providing a continuous supply of food. In contrast, the cold-water species only grew during short, discrete periods of the year. Overall, researchers say the warm water species functioned “faster”, with its organic material being rapidly processed by herbivores such as sea snails and limpets and with faster rates of decomposition. The study was conducted as part of the MRes Marine Biology degree, jointly run by the University and the MBA. The full study - Can ecosystem functioning be maintained despite climate‐driven shifts in species composition? Insights from novel marine forests by Albert Pessarrodona, Andrew Foggo and Dan Smale – is published in the Journal of Ecology, https://doi.org/10.1111/1365-2745.13053.